The MBA (Master of Business Administration is a post graduate degree that is awarded to students who have mastered the study of business. The MBA degree is thought to be one of the most prestigious and sought after degree in the world. Students of MBA programs study the theory and application of business and management principles. This type of study equips students with knowledge that can be applied to a variety of real world business situation. The main reason to attend school is to increase your salary potential and advance your career. Because graduates who hold an MBA degree are eligible for jobs that would not be offered to those who hold only a high school diploma, an MBA degree is almost a necessity in today’s business world. In most cases, MBA degree is rquired for executive and senior management positions. There are some companies who will not even consider applicants unless they have an MBA degree. People who hold an MBA degree will find that there are many different types of employment opportunities that are available to them. Many MBA programs along with a more specialized curriculum. Because this type of education is relevant to all industries and sectors, it will be valuable regardless of the career that is chosen after graduation. The SRGOC was incepted in 1998. The group introduced MBA programme in 2008 at SRIIT. 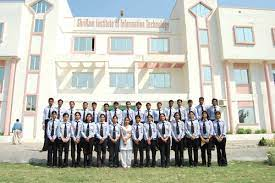 The MBA of SRIIT is affiliated to Jiwaji University and approved by AICTE. Vision: To became a global leader in Management Education by driving innovation, leadership and entrepreneurial spirit. Mission : To develop professional who ethically manage the business activities in a dynamic enviornment in which technology is a key determinants of organizational success. Competent full time faculties with vast experience. Modern computerized lab with internet connectivity. Admission Eligibility : Graduation with a minimum of 50% for general and 45% for SC/ST/OBC in any discipline and /or appeared in CMAT exam organised by AICTE & counselling by DTE Bhopal.